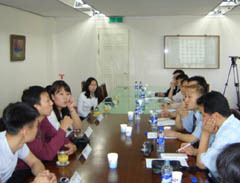 Ex-CIS journalists of Korean descent (left) are talking with South Korean journalists (right) at the Korea Press Foundation building downtown Seoul on July 9, 2004. "We are really proud of being a journalist of Korean descent," said a group of young journalists from the former CIS (Commonwealth of Independent States) countries of Russia, Uzbekistan, and Kazakhstan. The six young Russian and Central Asian journalists of Korean origin were holding a press meeting with a dozen of local journalists on the 15th floor of the Korea Press Foundation (KPF) building downtown Seoul. The press meeting was arranged by KPF. The third or fourth generation ethnic Koreans living and working as journalist in the Central Asian and Far Eastern Russian-speaking countries have been studying Korean language at Korea University in northern Seoul since July 5, 2004. They are Lee Men Sik of Russia's Sakhalin TV, Nina Vyacheslavovna Li of Vladivostok Radio in Russia, Olesya Nam of Koryo Newspaper in Russia's Usrisk City, Vilen Kim of Koryo Newspaper in Uzbekistan's Tashkent, Tatiana Pak of Koryo Daily in Kazakhstan's Alma-Ata, and Larissa Kim of a Korean radio station in Alma-Ata. The journalists, aged between early-20s and late-20s, are working in their own country either as a newspaper reporter or a TV or radio announcer. Their ancestors were moved to Central Asian countries at the hands of late Soviet dictator Joseph Stalin during the Pacific War. Posing with KPF's Assistant Manager Youn Hyun-Bae (center) are Lee Men Sik of Russia's Sakhalin TV, Nina Vyacheslavovna Li of Valadivostok Radio, Olesya Nam of Koryo Newspaper in Usrisk City, Vilen Kim of Koryo Newspaper in Uzbek's Tashkent, Tatiana Pak of Koryo Daily in Alma-Ata, Larissa Kim of Alma-Ata's Korean radio station. They were farming in Russian territories just north of North Korean border after they fled harsh colonial rule of Japan which governed Korean Peninsular from 1910 to 1945. Korea Press Foundation footed the bill for their 10-week Korean language education and stay in Seoul. KPF invited them as part of its journalist exchange program. The invitation of the Russian-speaking journalists were also aimed at promoting the use Korean language among the ethnic Koreans living in the Central Asian and Russian Far East areas. They will be given chances to go on a cultural and industrial inspection tour during their three-month stay in South Korea. For further details about the story or KPF journalists exchange program call 82-2-2001-7763 for KPF Assistant Manager Youn Hyun-Bae.